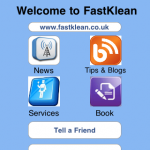 Hello readers, we at FastKlean cleaning company are excited to announce that as we draw ever closer to our ten year anniversary, we have released a new application for the iPhone. Now it is even easier for people to hire professional cleaners London for our wide variety of cleaning services. If you need help from a cleaning company in London, but you’re always on the go and unable to access a computer, if you have an iPhone you can simply download the FastKlean application in a matter of seconds and start booking our professional cleaners London. You can also find many helpful cleaning tips for tackling stubborn stains, and read our blog that is updated on a regular basis. We are always looking at new ways to improve our customer service and make lives easier for people in Greater and Central London with hectic lifestyles. Hiring professional cleaners London is one of the best ways to free a lot of hours in your week which would otherwise be spent on difficult chores instead of relaxing with friends and family after a hard day at work. If you find yourself struggling with daily chores then don’t hesitate to call our cleaning company in London to enquire about any of our cleaning services. We provide a variety of cleaning services to all areas in Central and Greater London. For carpet cleaning Greenwich call 020 8884 9149 for a free quote of our affordable and competitive cleaning rates.